Severe snoring is a curable cause of learning difficulties in children. Without prompt treatment, these difficulties may become permanent. Severe snoring is, however, surprisingly difficult to recognize -- which is why the AcuSleep test can change lives. It's common knowledge that even one night of poor sleep makes learning harder. Children with severe snoring may have poor sleep every night. Even the absence of discernable daytime symptoms does not rule out a pathologic condition associated with snoring. The snoring "C student" may have been an "A student" were it not for subtle sleep disruption associated with "apparently" benign snoring. That is, even when a child appears healthy and behaves completely normally, it is still possible the child's school performance is being impaired by sleep problems. 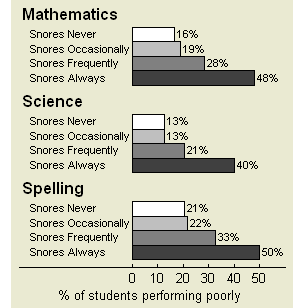 Snoring's impact on school performance may be permanent (see below). Experts now speak of "irreversible learning deficits" attributable to poor sleep. This adds some urgency to addressing pediatric sleep problems. But recent studies (see below) have linked poor school performance and isolated snoring. This is a very important discovery. In other words, children who snore have more learning problems even when the children test negative for sleep apnea. Bottom line: Testing children only for sleep apnea may miss some cases of poor school performance caused by severe snoring. Children with snoring and restless sleep have IQ scores 13 points lower than non-snorers without restless sleep. A study in Kentucky examined the snoring history of 1588 children aged 13-14. About half were poor performers in school, and about half were high performers. None of the children currently snored. The study found that the children in the poor-performing group were significantly more likely to have snored loudly and frequently at ages 2-6 than children in the high-performing group. The researchers conducting the study concluded: "Young children who snore loudly and frequently during their sleep are at higher risk for exhibiting lower grades in school several years after the snoring has resolved." This study has prompted concerns that learning deficits attributable to sleep breathing problems may be irreversible if they occur during critical times of life. A 2003 study of 1090 German third-graders showed a link between snoring and poor academic performance in three different school subjects. As the figure shows, in three of the school subjects, more severe snoring was linked to a higher chance of performing poorly. For example, 16% of non-snoring students performed poorly in mathematics, but 48% of the most severely snoring children performed poorly. Snoring was related to poor performance in science and spelling, as well as mathematics. Snoring was not related in this study to performance in handwriting or reading. Snoring's harmful effects can extend into adolescence and young adulthood. A 1998 study showed that medical students who snore are more likely to fail examinations. As the figure shows, 42% of students who described themselves as frequent snorers failed their final examination in internal medicine, compared to only 13% of non-snorers. Occasional snorers were in-between. Thus, failure was more likely in this study the more one snored. "There is now a growing awareness that sleep may play an important role in learning, by affecting the consolidation and integration of memory, with slow-wave sleep facilitating the assimilation of new knowledge, while REM sleep facilitates the accommodation of new memories." "All children should be screened for snoring." -- American Academy of Pediatrics, 2002.